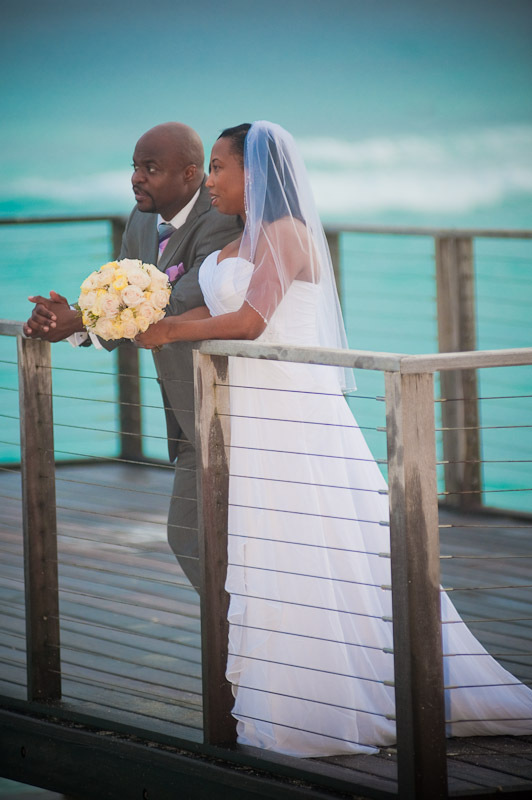 With love and hope and great anticipation, the bride and groom gaze into one another’s eyes and decide to have a storybook wedding on the beach in Barbados, the “Jewel of the Caribbean.” Sparkling blue sea, beautiful white beaches, brilliant sun … and a couple in love. What could be more ideal? The couple books accommodations (I hope here! ), take time off work, fly across the globe, and pass through all the hoops required to marry in Barbados. The morning of her wedding, the bride carefully unpacks the most beautiful dress she’s ever owned, an elegant white creation straight out of a Disney movie. She does her make-up cover-girl-perfect. She fastens her veil “just so” into her perfectly done hair. She’s nervous and excited. She and her groom, so handsome in his tux, are ready to legally make their commitment to one another on a beautiful beach in Barbados. Alas, it’s September. And even in fairy-tale-perfect Barbados, it rains in September in Barbados. It’s their wedding day and the beaches are wet, the sky is dark, the sea is deep blue, not turquoise. The bride and groom panic: What to do??? What a disaster! The day is ruined! You know what you do? You stomp your feet and shake your fists at how unfair it is that your wedding should get rained on. And then you pick yourself up and go right ahead without missing a beat — not to stoically endure your wedding, but to take utter and complete joy in it and each other. Your future happiness and your memories of a beautiful wedding aren’t dependent upon perfect weather. Indeed, rain on a couple’s wedding day can be a beautiful symbol of life itself. In a life well-lived, we allow ourselves to emote during the inevitable hard times in life … and then we get on with things with a smile and deep gratitude for life and love. As the couple looks back on the momentous day that they formally celebrated their love on a beach in Barbados, the newlyweds remember not the September rains but rather the fun of throwing off their shoes and running down the beach in the rain, laughing and playing like children. It was their day. Nothing could dampen their love and their celebration of their new life together. This beautiful couple traveled from the U.S. to marry in Barbados. Here, they're on the jetty just behind St Lawrence Beach Condos. I took this photo of Barbados photographer Leslie St John photographing this couple's beautiful day, in September, in the rain. 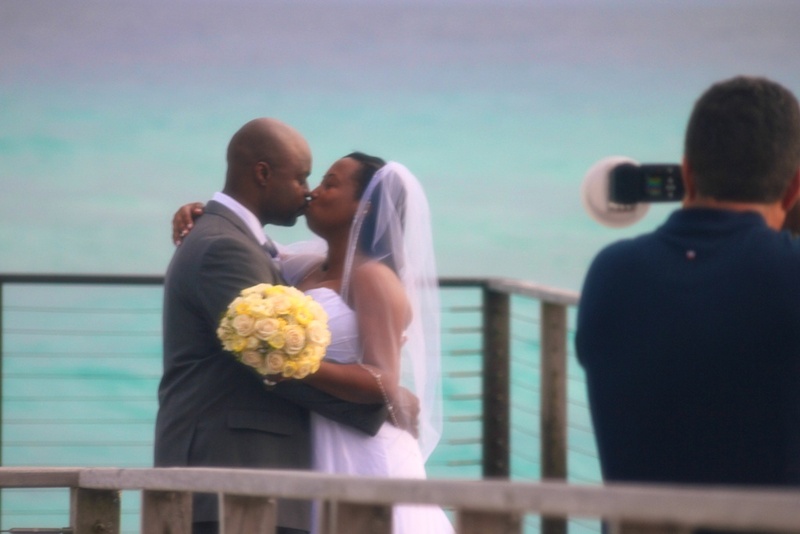 The fairy-tale wedding of the same couple … on a Barbados beach, in the rain, in September. Was this wedding absolutely perfect? Without question. Photo by Leslie St. John. Leslie St. John photo. This was taken on our jetty, just behind the St Lawrence Beach Condos in St Lawrence Gap, on the south coast of Barbados in Christ Church parish. 1. Hire a fabulous wedding photographer. No matter what befalls your wedding, having a great attitude – and an experienced and excellent photographer! – are essential. You will probably not own any photos in your life that are looked at more frequently than your wedding photos. You may contact the Ministry of Home Affairs at tel: 246-228-8950, fax: 246-437-3794. Cherylanng, what a beautiful sentiment! Here’s to love, wherever we may celebrate it and in whatever weather. A lovely read – I periodically check in to see what you’re writing about – still in hope that we get to Barbados someday soon. I loved this post. I got married on Rockley Beach in 2004. It rained in the morning, but then the sun came out a couple of hours before we took our vows. It was the most beautiful day of my life. It was just us and the priest and the beautiful ocean behind us. The planning from Michigan was a breeze. We hired a great wedding planner and the wedding was problem free. That is the reason why I love Barbados. It was the official start of my life with the love of my life. I always love your comments, Rainy. You show a passion for living life. Thank you for this. Lynn, good morning! I have no doubt whatsoever that you’ll make it to Barbados one of these days, none whatsoever. I look forward to seeing you in paradise! 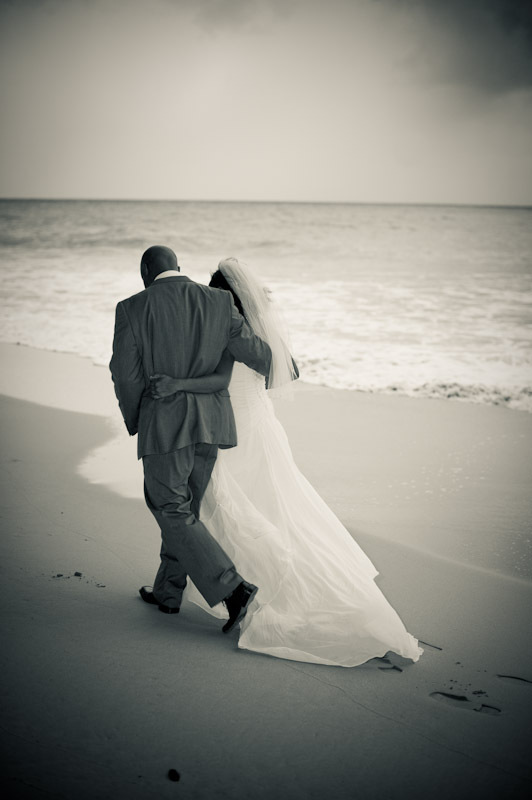 I especially like the picture of the bride and groom walking along the beach . Relly a beautiful shot. Like being in a movie! PS. We recently booked Leslie as our photographer, glad to hear you recommend him as well.